Our programmable Night Set Back system offer a more basic control solution. For more basic control solutions, we have two building regulation compliant Our tamperproof Night Set Back system offers a more basic solutions. What is the response time of a surface heating and cooling system? Thanks to close and accurate controls, the response is rapid and accurate. At Warmafloor we have long invested in quick and comprehensive controls. Our total integrated control strategy is intuitive and uses Proportional-Integral-Derivative logic (PID) to optimise energy distribution and ensure a consistent temperature. 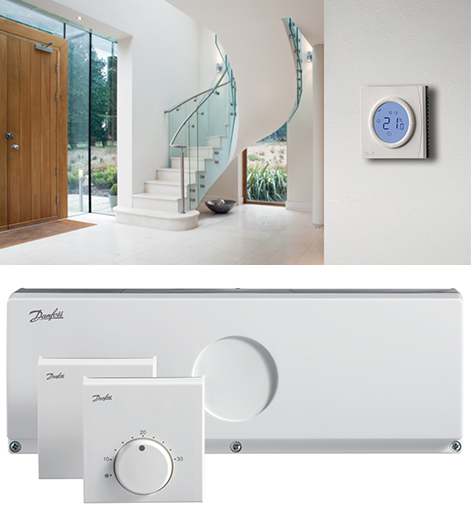 It ensures a rapid response time and is accurate to within 0.5˚C as opposed to the 4˚C band of thermostats to ensure lowest running costs.